There is no love lost between the conservative Hannity and late night talk show host Kimmel. 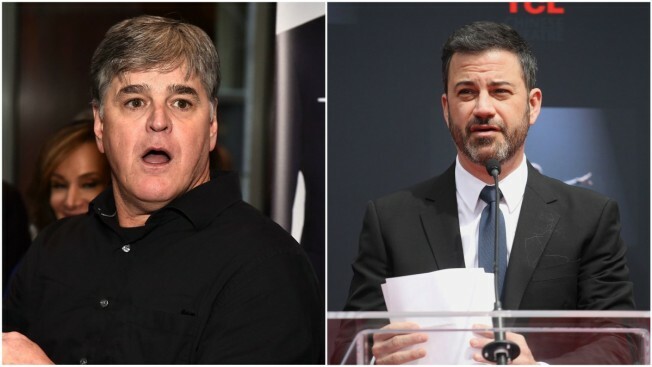 The war of words between conservative talk show host Sean Hannity and late night host Jimmy Kimmel took a decisively ugly turn Friday as the Fox host slammed the comedian as a "pervert" and "Harvey Weinstein Jr." for raunchy comedy bits taped years back where he asked women on the street to feel his crotch area. "This is ABC’s @jimmykimmel aka Harvey Weinstein Jr. Asking 18 year old girls to grab his crotch and “put their mouth on it”. Jimmy that’s you being a pervert a--hole," Hannity wrote. "How would you feel if that was your daughter? I bet @Disney is so proud." Hannity continued on the offensive Friday. But Kimmel did respond. The late night comic noted each of the women who participated in the skit was a "willing participant" who signed a waiver before the segment broadcast and in no way compared to the abuse some have alleged occurred at the hands of Weinstein.